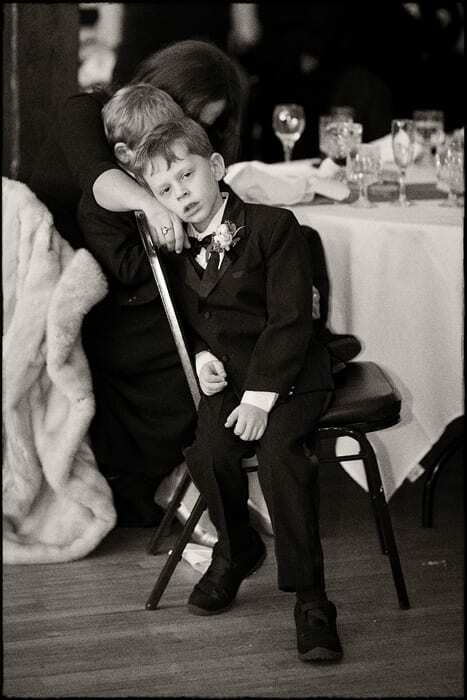 Many wedding photographs tell a story that one wouldn’t understand well unless they were there. I chose this photograph today because of it’s simplicity and a little bit of a vintage look. The story behind this image makes me laugh when I look at it. Before the wedding, we were trying to capture a few family photographs before the nuptials to give the bride a groom a minimal amount of family historical photographs to take afterwards. I feel like I have had the ability to connect with kids fairly well but it was certainly a challenge to get all of the kids looking at the camera at the same time. This particular young man enjoyed making faces at the camera and running into a few of the other photographs. He was like any other young man that had to dress up for the day and enter a formal event, he played, ran around, and made the most of his time as a young boy. Well, at some point, gas must run out of the engine. This is a photograph taken with his mom and brother. You can see his mom’s hand wrapped around his chair and he is taking a much needed break. This is an example of a photojournalistic portrait, not posed, but with the subject very camera aware. A photographer is allowed one snap, and then this turns into something else.